South Fork: home of TV's Ewings, an area in Utah, Phil Wilson's collaboration with Spyderco, or the place where the idea moves in another direction. Phil Wilson made his name with a back-to-the-future design philosophy, while most makers favor a full-tang hunting/survival ethos Phil Wilson's is more hidden-tang fishing/hunting. All over the world people cut up fish with long thin flexible blades, all over the world butchers use long thin blades. Yet all over the world knife makers sell short, thick, rigid blades as 'hunting' 'outdoor' and 'skinning' knives. As ever, my interest was piqued by the idea of outlying performance coming from outlying thinking. Having owned a few 'sharpened pry-bars' over the years I was curious to try out his potentially 'foodie-afield' concept. So when Phil Wilson's Spyderco collaboration turned up at a price I could almost justify, in yet another moment of weakness I bought one. Spyderco have always been one of my favorite companies, not just for their wonderful sharpeners and lazer-like folding knives, but the way Sal and Gail Glasser run their enterprise. Spyderco have a way of speaking to their customers, 'speaking to' is wrong, they have a discourse with their customers that melds bespoken with small-to-medium production runs. You get a tool closely designed to a users brief, from a production run that's big enough that you can actually buy one, but small enough that there's a lively secondhand market for most of the designs. I've seen 'business guru's' and 'marketing thought-leaders' waffle on about engaging with the customer, every time I've put my hand up and said "like Spyderco?" I've been greeted with blank incomprehension. Look and learn people. Spyderco have made a good thing out of offering: generalist and niche tools, in limited edition colours and specifications, feeding their customers interest not only in the designs but the materials. partnering with designers, makers, and groups of fans. Using the internet's knife forums as focus groups, and achieving that holy grail - offering the customer what they didn't know they wanted. Look and learn people. Look and learn. "The South Fork has evolved over about 20 years of my own use and from feedback from those who have used my custom knives. It is named after a mountain and valley area in Utah where I have hunted for Mule Deer and Elk. I guess you could call it a general purpose Sportsman, Working/ Utility knife. The edge sweep and trailing point make for an easy cutting geometry. The sharp point comes in handy for fine work like caping or removing a splinter or cactus spine. The belly sweep and slightly dropped handle position the blade in the hand for skinning big game. Some prefer a drop point or semi skinner for field dressing and skinning chores, but the trailing point has worked very well for me as well. Some will also prefer a shorter blade but again my preference is for a little more reach for boning out an elk quarter or removing the back strap. Some blade shapes are more efficient for specific field tasks but it is my humble opinion that the trailing point can cover a wide range of tasks easily." Most fishing knives are a bit longer in the blade than this, most hunting knives a fair bit shorter. Will this be best of both worlds? 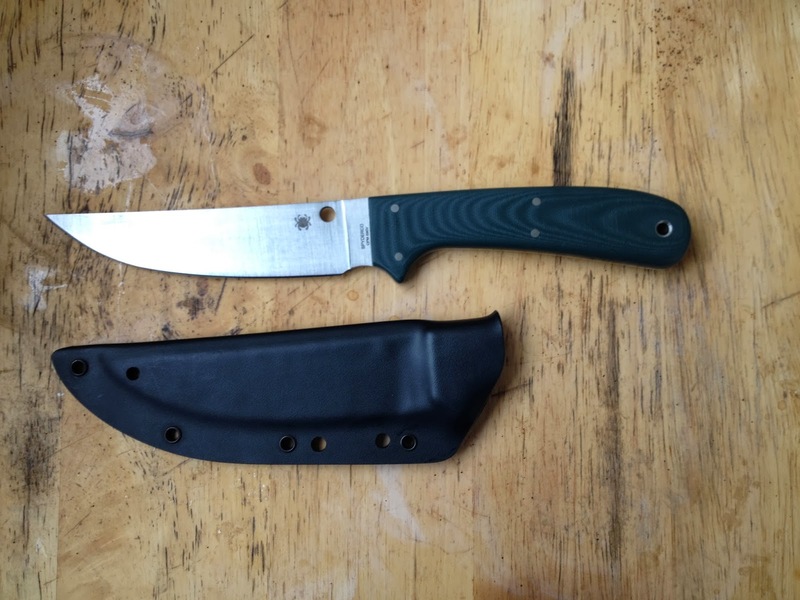 The is the first time I've seen Boltaron used as an alternative sheath material to Kydex, I don't know what its like to work with, but it's very nice stuff in the hand. The grade Spyderco have used here is a tad thinner than the kydex I've used to make sheaths, and the surface just a little smoother. It would seem to have exceptional shape hugging properties. One to watch. Would I buy one for 'list price'? It's a very nice knife, made of the best materials, to a really high standard of fit and finish, but there are other knives that would get my $429.95. There are other Spyderco's that I'd buy before I'd saved up the money! Would I buy one for 'street price'? Hell yes. I very nearly did. the South Fork has been a serious contender on my wish list for a while. On the day I had a window open and was about to press 'order now' at a more reasonable $230 on Amazon, when I found this example secondhand. I'm only going to use/scratch mine, I don't have any drawer queens, so I was happy to save more than a few bucks by going pre-loved. PS I have a meat related project in mind, stay tuned for some real world testing in part two.